I read with dismay your recent “Open Letter to the Presbyterian Church,” in which you referred to the Israel Palestine Mission Network of the Presbyterian Church (USA) as “extremist” and called to their newly-published study guide, “Zionism Unsettled” a “dishonest screed.” As a rabbi who works actively alongside the IPMN – and whose words are quoted extensively in the guide – I am saddened by your words and feel compelled to respond. As you might imagine, I take exception to your characterization of me as an “(accomplice) to sweeping denunciations of the Jewish people and their sacred traditions.” Needless to say, if I felt for a moment that “Zionism Unsettled” represented an attack on Jews and Judaism I obviously would never have agreed to be quoted in the guide. Granted, ZU is not a perfect document – but while I might disagree with some of its characterizations and specific points of rhetoric, I do believe it shines a courageous and important light on the ideological roots of the political reality in Israel-Palestine. It certainly bears little resemblance to the “anti-Semitic,” “ignorant” tome you so thoroughly excoriate in your letter. Even a cursory study of history reveals the varied and complex forms that Zionism has taken over the centuries. The yearning for their national homeland has been woven into the Jewish community’s daily life for millennia. The Torah (Deuteronomy) and the Tanakh (2 Chronicles) both end with images of yearning to return to the land; synagogues face Jerusalem; the Passover seder celebrated annually concludes with the prayer, “Next year in Jerusalem.” To suggest that the Jewish yearning for their own homeland—a yearning that we Presbyterians have supported for numerous other nations—is somehow theologically and morally abhorrent is to deny Jews their own identity as a people. The word for that is “anti-Semitism,” and that is, along with racism, sexism, homophobia, and all the other ills our Church condemns, a sin. I believe your characterization of my sacred tradition is incorrect – and dangerously so. It is prejudicial in the extreme to equate Zionism with Judaism itself. Zionism – that is, the movement to create a Jewish nation-state in historic Palestine – is in fact a political movement that was born in 19th century Europe. As such, it was a conscious and radical break with centuries of Jewish tradition that strongly cautioned against the establishment of an independent Jewish state in the land. While it is certainly true, as you write, that the yearning for a “return to Zion” is suffused throughout Jewish tradition, it is important to note that this yearning was pointedly directed toward a far off messianic future. The rabbinic sages repeatedly and forcefully forbid the “forcing of God’s hand” through the creation of a humanly-established, independent Jewish state in the land, which they believed would occasion disaster for the Jewish people. Throughout the centuries, the Jewish return to Zion functioned as a symbolic expression of hope – not as a political call to action. Contrary to your assertion, “Zionism Unsettled” never makes the claim that the Jewish yearning for return “is somehow theologically and morally abhorrent.” It simply makes the correct distinction between a centuries-old religious tradition that spiritualized the notion of return and the politicization of this idea by a modern nationalist movement. In this regard, I find your use of the term “anti-Semitism” to slur those who oppose Zionism to be particularly pernicious. In fact, as I point out in the guide, before the establishment of the state of Israel, the political Zionist idea was hotly debated within the Jewish community itself. Many reputable Jewish figures such as Rabbi Judah Magnes and Hannah Arendt warned that the establishment of an exclusively Jewish state in a historically multi-religious and multi-ethnic land would inevitably result in conflict and a permanent state of war. It was certainly not “anti-Semitic” of them to suggest such a thing. On the contrary, they – and many others like them – were motivated by their concern for the security of the Jewish people and as well as for the well-being of all peoples who lived in the land. While it is true that Jewish anti-Zionism has become a dissident voice in our community since the establishment of the state of Israel, as a rabbi who works actively in the Jewish community, I can attest that there are growing numbers of Jews – particularly young Jews – who refuse to tie their Jewish identity so thoroughly to the highly militarized ethnic nation-state that Israel has become. All are welcome to walk through our doors and speak with our name and under our roof, be they Zionist, anti-Zionist, post-Zionist, or non-Zionist. We are an institution that seeks to foster spirited debate, constructive dialogue, and a safe space for all, in keeping with the Jewish tradition. I trust you would never suggest that these Jewish students are driven by “anti-Semitism.” On the contrary, they are clearly motivated by sacred Jewish values and a courageous refusal to reduce Jewish identity to one political ideology. It is particularly notable that a number of prominent liberal Zionist voices are publicly voicing their support for the students of Swarthmore Hillel, indicating that our community may well be ready to return to a truly wide-tent debate on the role of Zionism in Jewish life. 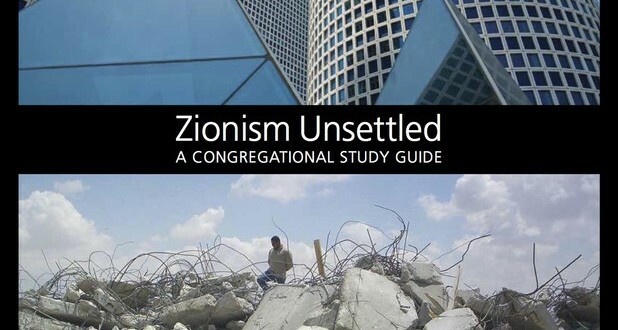 For all of this, however, “Zionism Unsettled” does not, as you suggest, “(attribute) the plight of the Palestinians to a single cause: Zionism.” On the contrary, the study guide repeatedly points out that the political strife in Israel/Palestine is rooted in religious exceptionalist attitudes that are embedded within Judaism, Christianity and American culture alike. For many of us, these are the critical – and too often ignored – questions for interfaith dialogue: what will we do with those aspects of our religious traditions that value entitlement over humility? Do we believe that this land was promised by God to one particular group of people, or will we affirm a theology that promises the land to all who dwell upon it? Will we lift up the fusing of religion with state power and empire or will we advocate a religious vision that preaches solidarity with the powerless, the disenfranchised and the downtrodden? As a Jew, I can only respond that it is not for you – or anyone – to blithely conflate the tenets of a modern nationalist movement with a venerable and centuries-old religious tradition. And it is certainly not “anti-Semitic” to say so. This entry was posted in Anti-Semitism, Christianity, Interfaith, Israel, Palestine, Religion, Zionism on February 19, 2014 by Rabbi Brant Rosen. Thank you, Brant, for this brilliant and important post. The dangerous and incorrect conflation of Zionism with Judaism has been so destructive to Judaism itself and to the values that are so critical to the Jewish faith we share. By conflating Judaism and Zionism, Judaism becomes the religious legitimation for the establishment of an exclusive Jewish state in Palestine, the expulsion of the native inhabitants and the destruction of their villages, and the continued stealing of their land ever since 67. A “Jewish” state that privileges Jews over people of other faiths and that maintains a brutal military occupation, can in no way claim to represent Judaism. It is a state that violates the core principles of our faith. We need to examine, and I believe reject, those parts of our traditions – Jewish, Christian and Muslim – that privilege the members of our faith communities over others – and highlight and affirm those part of our traditions that teach us about the God that is manifest in every human being who calls us to love and ensure justice for all. Enough of chosenness, Promised Land, salvation only for the faithful! Yes, to justice, compassion, equality and dignity for all! It is truly wonderful that the debate about the relationship between Judaism and Zionism is now a part of the public discourse and we are all indebted to you for your clear and courageous leadership in this question. Yishar Kochecha/May God bless you with strength to continue this critical work even in the face of slurs and personal attacks. Yes! Thank you, Rabbi Brian, for your wise and prophetic words, as well. As a Presbyterian pastor (serving three Lutheran churches and an American Baptist church), I agree with you that ALL people of faith need to examine and reject the dangerous “parts of our traditions… that privilege the members of our faith communities over others.” Blessings to you in your ministry. When I read Rabbi Brant’s calm, constructive and open replies to an angry rant like Rev. Leighton’s, my lungs fill with a cool breath and I feel space open to loving difference. The Israel/Palestine conflict is an important issue — but the creation of such a space is even more important. Thank you, Dharma Brother Brant. Already getting emails of praise for your fantastic retort. JVP-LA loves and appreciates you! I find it a “bit” ironic to have a Presbyterian minister quote my sacred texts to support his argument that I am an anti-Semite. At the risk of your displeasure and possible censoring…I can’t help but agree with the reverend…what you can not understand is that…now in the present time…Israel is with Jews…in the worlds eyes..the same exact thing…no matter how the few Jews as yourself deny it…the new anti semitism is anti Zionism …that’s a fact..no matter if a couple of Jews back when didnt think Israel was a good idea…. thankfully, you are becoming part of the minority. Thank you, Rabbi Brant, for your thoughtful and targeted response. Your skills for surfacing important issues in a noncombatant manner are exceptional. I wish that more activists had your skills. These issues are too critical for the future survival of humankind on this planet to be summarily “delegitimized and debunked.” I do not understand how anyone who cares for Israel can dismiss your comments. Perhaps your words will influence others and gain momentum in ways that the words of Elmer Berger, the Rabbi Outcast, did not. We deeply appreciate the personal sacrifices that you have made to keep bending the arc of justice in a positive direction. A clear, measured response, well-written. Shared. Thank you for every thing you do. You are my hero. Thank you, Rabbi Rosen, for writing this and sending it to us. As a member of a Jewish congregation and American who is an activist for just, constructive foreign policies in my country, I have become increasingly aware of the role of unquestioned Zionism in mobilizing support for unjust U.S. and Israeli policies. After reading your initial review, I bought 10 copies of this book to share with activists, representing many faiths, in my community to provide a lens for developing community discussions to strengthen our interfaith activism. I appreciate your help in providing us resources for this kind of work. That particular Presbyterian Church obsession with Israel is rooted in its supersessionist theology. There is nothing and no ideology more abhorrent and anachronistic than supersessionism. It is the mother of all fascisms. Supersessionism means that you consider dead the religion you decided you have replaced. Supersessionism is therefore tantamount to genocide. That Church’s members realize there is a problem with the theology and ask questions: how could it be that the Church has replaced Israel when Israel is sovereign, live and kicking? How could it be that wrong? And so they are leaving that Church by the hundreds of thousands. Just look at the statistics. This is the reason for their obsession with Zionism – a euphemism for Judaism – and no other. Thanks once again Brant, for this brilliant and useful response to Rev. Leighton. You highlight the central moral, theological, political and even historical points and do so in a respectful but careful and challenging style. I only hope today’s “Shalom Rav” blog receives the widest possible circulation and may it spawn not only more careful thought about the issues raised in “Zionism Unsettled,” but let’s hope there are study groups formed in synagogues, churches, mosques, universities, and homes. We are indebted to you once again and deeply grateful for your principled insights. Thank you for this very thoughtful and powerful response. I am continuously awed and inspired by your prophetic witness to speaking truth and to pursuing justice for all people – no matter the criticism you might receive. I am thankful for your voice in this important conversation and hope to continue to learn from you. I guess cool heads do prevail. What a rant. Nothing but regurgitated rhetoric with no substance, no evidence, and not a thought for creating an atmosphere for argument. The old phrase “its my way or the highway” seems to work here. We all yearn for a slice of freedom, or something better than what we already have, but taking it without permission is not a good practice. Nice job on the return letter. Wonderful Brant. I am so grateful for your voice and for your heart. You have been a teacher to me, and your encouragement has helped so many of us (myself included) to find our voices in spite of our fear of being labeled anti-semitic. I returned from a recent trip to Israel and Palestine thinking a lot about the vision that you lift up of a sacred land that offers peace and security for all people who inhabit it. Your willingness to stand against the fear of an open dialog offers a genuine possibility for all of us to work together against anti-semitism where it is real, along with islamaphobia and so many other of the hates expressed against an entire race or religion or nationality or class or gender or sexual orientation of a people. I find myself increasingly drawn to work with Jewish colleagues who are willing to ask these hard questions about the State of Israel – and the assumptions about Zionism that are its foundation – on combatting all hate filled speech and action wherever it exists. This is one reason that the Presbyterian Peace Fellowship broke with a decades long tradition to offer our annual Peace Seeker Award to a non-Presbyterian organization – Jewish Voice for Peace (along with the Israel Palestine Mission Network of the Presbyterian Church (USA) in 2013. Your courage inspires us to similar acts of courage. Rabbi Rosen, I often share your blogs with others because they are such fine examples of how to model insightful, thoughtful, and convincing discourse in response to opposing views. Your blogs are always well worth the reading; this one is truly inspirational and I’ll share it with many. Thanks for being who you are and doing what you’re doing. I guess you know that in his books Naim Ateek does exactly that. Actually, he does the exact opposite. Have you actually read any of his books? I have read what Naim Ateek says about Judaism and Palestinian Christianity in both of his books. I am pretty sure many people who support him have not. He complains about Zionist racism throughout what he calls the Old Testament. He says Jews treated the Caananites badly because the Jews were racists. He says Isaiah wrote a racist text. The only prophet he fully respects is Jonah. He has imported European ideas about race which arose at the end of the 18th Century into texts written by Jews thousands of years before that. So the question is have you read both of Naim Ateek’s books. It sounds like you haven’t.